At every turn, the Riviera 3600 Sport Yacht truly epitomises the excellence of Riviera. 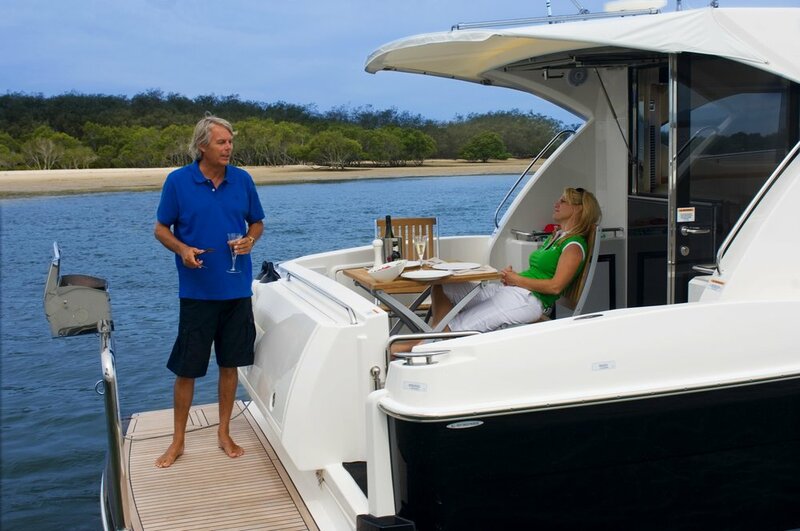 Everything about this vessel is designed to make your boating easy, relaxed and fun. From the carefully considered layout to the luxurious fit and finish of the finest of details, right through to the state-of-the-art technology at the helm, everything blends beautifully to ensure your precious time afloat is always a sheer pleasure. The clever cockpit design of the Riviera 3600 Sport Yacht is an idyllic environment to share leisure time with your family and friends and, of course, style goes beyond looks in that it is functional, as well as fashionable. One of the boat's most striking features is the large awning window that opens out from the saloon to create the ultimate alfresco experience. The fact the gourmet galley is located on the same level as the cockpit and saloon also means that the chef remains right in the middle of the party, enveloped by an amazing sense of light and space. At every turn you will find Riviera ingenuity — real boating knowledge and careful consideration to make your time aboard nothing but a delight. This syndicate is based at Swan River in Perth, Western Australia's capital city, which is a five-hour flight from Sydney or Melbourne and a leisurely 3.5 hour drive from the Margaret River region. Shared between five owners, each partner has a real sense of ownership and can enjoy the flexibility of making shorter notice reservations, simpler swaps with co owners and better use of the standby function. All owners have access to a shared mooring at Rottnest Island and Palm Beach and a private berth at Mandurah. Boating Partnerships is working with R Marine Mandurah to ensure the best possible service is provided to owners. With transparent running costs, the partnership term for this vessel is for three years with each owner receiving 68 days usage per year or 17 days per quarter plus standby days.